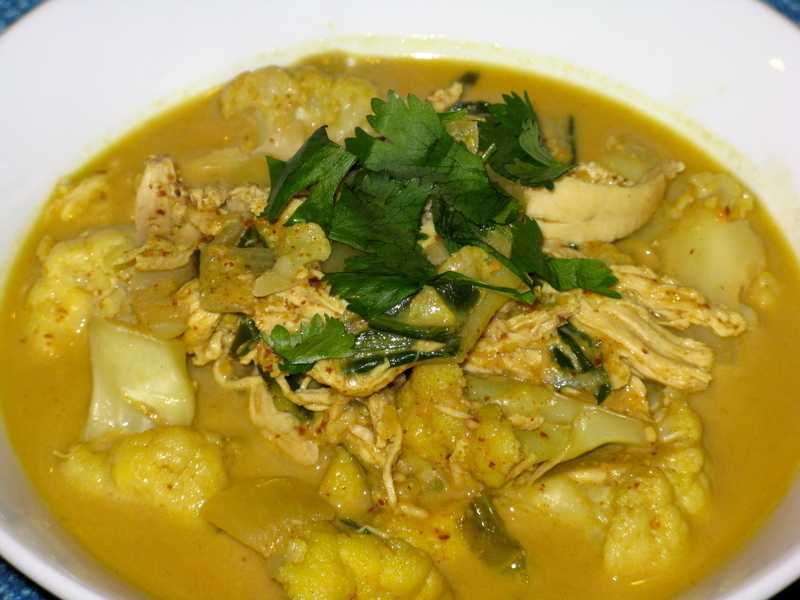 This curried soup is a recipe that I previously made as a vegetarian and really enjoyed. Surprisingly though, I think I only made it a total of one time. I feel like I have a lot of recipes like that, actually — I make something, am totally into it, and then forget about it somehow. Regardless, I’m glad I remembered it because it has fantastic flavors and a nice little kick. 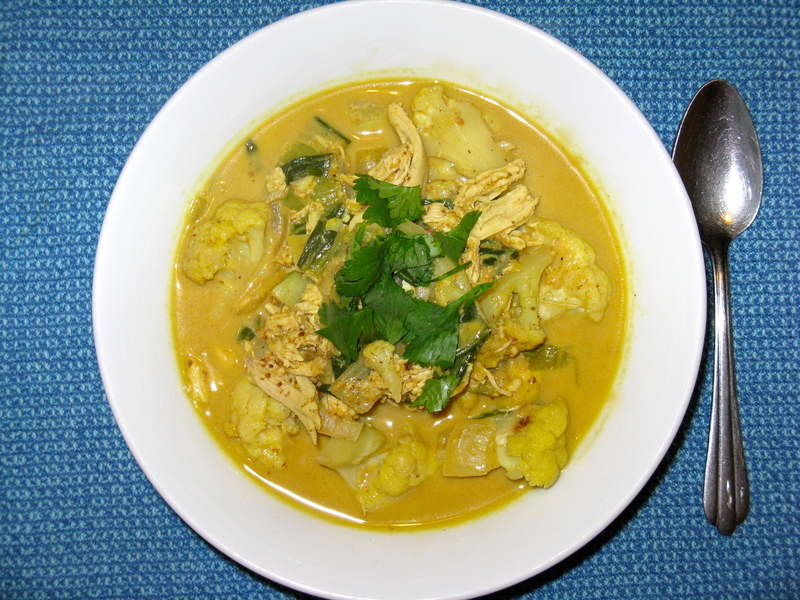 It’s obviously no longer vegetarian because I added chicken to it to beef it up and make it a curried chicken soup, but if you are a vegetarian, just omit the chicken and use vegetable broth. Side note here, but this soup warms me up so much that I have to turn the heat off when I eat it (no exaggeration). It’s either that or shed layers, and I prefer to eat with my clothes on. Melt the butter in a large pot over medium heat. Add the onion, garlic and ginger and sauté a few minutes, until onion is translucent. 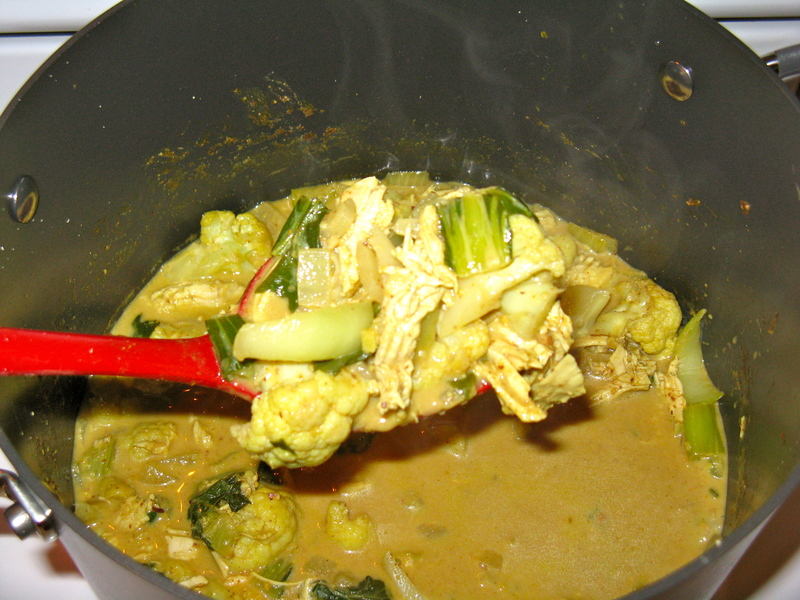 Mix in the curry, allspice, sea salt, cumin, cauliflower and bok choy, and continue to cook for 5 minutes. In a separate small saucepan, mix the almond butter and 3/4 cup of broth together over medium heat. Once the mixture is smooth, add it to the vegetables and stir for a couple minutes. Add the shredded chicken, remaining broth, coconut milk and cayenne. Heat for about 5 minutes, or until heated through. Serve with cilantro garnished on top, if using. Oye! That looks ahhhmazinggggg. It’s a good thing you have the blog to hunt down old recipes! I do that occasionally and wonder how I forget about the nom dinners I have made previously! This recipe was never posted on my blog before though. It was in my recipe files in my cupboard! I’ve only had this blog since this past May and never while I was vegetarian.